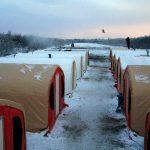 This camp was barged from Anchorage to Tanaga Island to support an environmental cleanup operation. 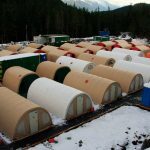 This housed up to 44 workers on site, fed them 3 times/day, provided all services that are standard in most Taiga camps (fresh/gray water, full service kitchen, laundry/shower, satellite comms, power generation, safe/comfortable/warm shelter). Resupplies were labor intensive, originating in Anchorage, shipping via AK Airlines to Adak Island, then helicopter chartered and slung to Tanaga Island when the weather would cooperate. The project last 90 days and the weather did not cooperate often, including gusting winds up to 90mph and horizontal rains. The tent structures were all duck billed into the ground for security.